eBay currently has a coupon that's good for 10% off items from 111 different sellers that are priced at $50 or more. 100 minutes, 100 texts and 500 MB data per month - regular price $60/360 days, with coupon $54 ($4.50/month). 500 minutes, 500 texts and 500 MB data per month - regular price $99/360 days, with coupon $89.10 ($7.43/month). 1000 minutes, unlimited texts and 1 GB data per month - regular price $179/360 days, with coupon $161.10 ($13.25/month). Unlimited minutes, unlimited texts and 1 GB of data per month - regular price $205/360 days, with coupon $184.50 ($15.38/month). Unlimited minutes, texts and 4 GB of data per month - regular price $360/360 days, with coupon $324 ($27/month). Unlimited minutes, unlimited texts and 1 GB of data per month - regular price $69/360 days, with coupon $62.10 ($20.70/month). Unlimited minutes, unlimited texts and 4 GB of data per month - regular price $109/360 days, with coupon $98.10 ($32.70/month). The plans are available on your choice of Red Pocket's four networks. They come with SIMs for GSMA (AT&T), GSMT (T-Mobile) and CDMA (Verizon). For CDMAS (Sprint) you need to use the SIM that should have come with your Sprint phone. Shipping is free. As you probably noticed, Red Pocket's eBay plans are now based on a 30 day month rather than a calendar month. That means plans no longer renew on the same day each month and the 12 month plans are now 360 days instead of a full year. Not a big deal but something you need keep in mind when tracking usage and renewal dates. The eBay PLAYOFFS18 coupon is good until 8:00 AM PST, January 15 on items priced at $50 or more. The maximum discount per customer is $100. Not that impressed. I get UTnT + 2GB for $27 on H2O, and I don't have to let them sit on my money for a year. 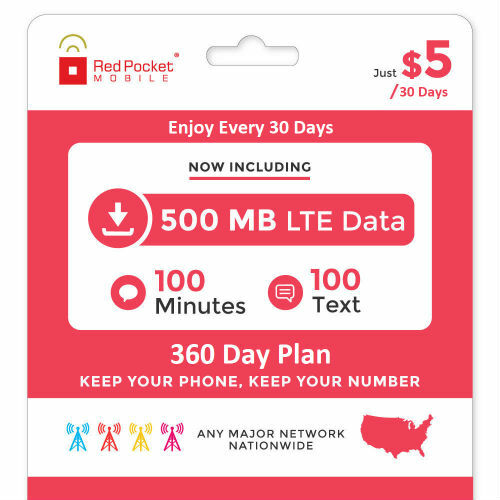 You get 4Gb for that same $27 on Red Pocket or, if that doesn't suit your needs, $21.25 a month nets you 3Gb plus Unl T/T when purchased through Amazon. You can choose your carrier on Red Pocket though, some of the other carriers are a better value. Do you know if 1. time limit after purchase to activation? 2. Can this be used to extend a current Red Pocket activated number? I bought a year plan on black friday 2016 and used it almost a year later it it worked just fine. Not sure if it can extend the expiration time. Should have used the 20% off coupon eBay had a few weeks ago.